Basically, the entire configuration is a symmetrical class A amplifier incorporating an input filter stage, an intermediate driver stage and a powerful symmetrical output stage consisting of the versatile 2N3055 power transistors. The circuit efficiently drives a 100 watt 4 Ohms speaker with inputs derived from any audio source like a cell phone or DVD player etc. A quick glance at the given circuit diagram makes us conclude that the output configuration is not symmetrical, since the transistors T15 and T16 are both NPN types. The input stage of the circuit begins or initiates with a symmetrical differential preamplifier stage consisting of the transistors T1, T2 and T3, T4.T5 and T6 are positioned as the current sources which are further extended as the driver stage consisting of the transistors T7 and T8. However a closer inspection tells us that of course the wiring is symmetrical, having the transistors T11, T13, T15 at the upper section acting like special booster transistor package.Similarly the lower section also employs identical super booster stage consisting of the transistors T12, T14 and T16. The above two sections are perfectly complementary to each other, with reference to the diagram which indicates their emitters being terminated to a common point through the resistors R25 to R27 and via R28 to R30, this effectively that the wiring is exclusively symmetrical by nature. The output stage is able to produce a massive 200,000 times amplification factor with comparatively very low quiescent current drain.The quiescent can be set by the adjusting the preset P1. Due to a non critical nature of the circuit, the entire project can be easily built over a general purpose PCB, however the layout of the components or rather the placement and the ratio of the distance of the components must be kept as identical as possible to the layout of the circuit diagram. Though a common heatsink may be used for the entire set of the output devices, I personally used separate individual heatsinks for each of the transistors. This saved me from the headache of using the cumbersome and low efficient mica isolation kit between the transistors. The inductor is kept for improving the dynamic nature of the circuit. It is built by winding 20 turns of super enameled copper wire over the 1 Ohms resistor itself. 3) Next adjust the preset such that the meter reads an input of 50mA, that’s all, the amplifier’s quiescent current is set and now the connections may be restored for the normal operations of the system. The power supply circuit is also shown along side and as can be seen there’s nothing special about it and may be built using the shown ordinary sets of components. Thanks for such a perfect tutorial….. I made with your guidance of this post…. Here is the video link for my working amplifier…. I built this circuit (in the end) by making the PCB with DipTrace (Used LEDs instead of Zeners). Its working marvelously with Technics Speaker Boxes (as my Technics SU V303 was condemned) Swagatham Sir…. Thank you very much for publishing such a great circuit. That’s amazing Siva, could you please send a small video clip of your work to my email? I can compensate Rs.200/- for it…. if only it is possible… not a force…keep up the good work! Please send your email. I have made a video and send you the same. I have sent the video to the above email. Hi Siva, I’ll check it soon and let you know! This could not work with the schematic with that black bg as is. Like I said. Just take a look at T14 for example, B-E junction? Can’t anyone see anything fishy there? PCB is not strictly necessary if the assembler knows how to solder components on a veroboard. The first design is also correct, it just has a slightly different configuration compared to the last one. All these designs were tested by elektor electronic engineers. The last design was built by me on a large veroboard and it worked at the first instant. elektor’s crescendo was a mosfet amp, not a bjt based one. and this amp is about 50w (on 8 ohms) not 100w, unless it’s on 4 ohms, and then not enough outputs are there and it will eventually blow if pushed a little too much. one pair of 3055s on a complex 4 ohms load is asking for trouble. Hello. I am trying to simulate this circuit on microcap and it seems nothing is working. Output is just some nonsense, I think I’m making a mistake that I cant figure out by myself. It really bothers me, Also tried it on Altium. If anybody could help me with that I would be really grateful. Hello, please try the one which is shown at the end of the post…the design has been practically tested with awesome results. 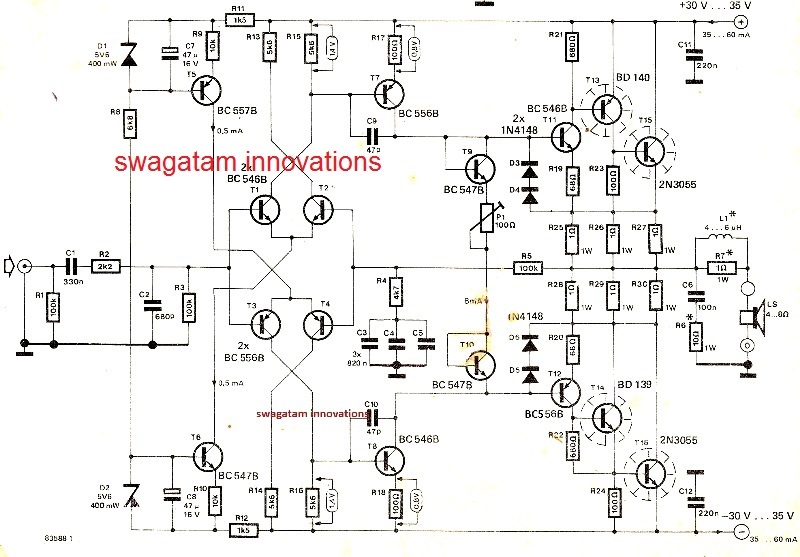 thank u swag.i am very u very much interested of the nice circuit.can u explain why u have included two stage of differential pre amplifying with 547 etc .will one stage pre amplification not it be sufficient adding more stages complicates the circuit .will u give some explanatory note of significance of different pre amplifier transistor ,thus it will provide full understanding of amp circuit working. thanks Jegadeesan, however I will not be able to explain the details in-depth because amplifiers are difficult to simulate in mind. Can this circuit can be inserted with a USB slot? Hello Swagatam, i love to try this amp out because i have four 2N3055 just laying around doing nothing(: but sadly this transistors "BC546, BC556, BC557B, BC547B, BC556B, BC546B" are no where to be found on Indian e-commerce sites, so can you please give me an equivalent replacement for the transistors. Hi Lima, The BC546, BC556, BC557B, BC547B, BC556B, BC546B transistors are one one of the common types of transistors that one can find in any market….it's surprising that you could not find them anywhere….in my place these can be procured in bulk. anyway you can use any 100mA or 200mA rated transistor having a 100V as the max V rating in place of these BJTs. I don't remember the specification of these transistor. but the circuit was +22 0 -22 volt dual supply (with 18 0 18 CT 3Amp transformer) Can I use 2N3055-MJ2955 ? I was Constructed a 30W+30W Cassette Deck very long ago, using N055 & P055 Transistor in Golden PCB (Gemini Radio, Chadni Chawk). I get the Circuit diagram from a book of Debashis Bandhopadhyay (ERC publication). Recently all Transistors are burnt out but, I want to repair the Amplifier. I have lost the book. I did not find the Transistor or Circuit Diagram in Gemini Radio. Please give me the circuit diagram of the amplifier of N055-P055. And suggest me where can I find the Transistor or it’s substitute. you can use only one pair of transistors at the output stage instead of the shown 3 stages. please tell me the voltage and current specifications of these transistors, because these are obsolete parts now and no info is present anywhere. This amplifier is the modified version of the original 40+40w amplifier circuit by MD Hull a pioneer designer for Philips nv Netherlands. The circuit has very good bass and treble at very low volumes. I built this amplifier completely as per instructions ( book was published by Norman Brothers in India) in 1990 and is working perfectly to date. I had used only with modification of bd182 with 2n3055. The bass and treble control and the preamp were build and used as were given in book. The bass is far better than the now days used driver driven subwoofers. I had used 0-54v transformer 3A (guru make), dome tweeters*4 of Philips, mid range of 80w and woofers of 10 inch Bolton make with cross over. This whole audio system cost me around 8230rs in 1990's. But believe me even Bose or marantaz or sonos does not compete with it any way in any frequency levels. The bass and treble is very good. Thank you for this interesting update!! Whats the max input(audio) RMS voltage? how about these sanjeev…C2073 and A940. i have question please it can work on 12 v dc ? BC447 is not the problem unles it's faulty…the circuit is huge and the fault could anywhere in the design. i'll try it on a proper PCB, then we'll see if it works..
Hi, I saw this circuit a long time ago, but didnt had the time to actually do it, my question , is the schematic good ? ( i read here that the 2nd photo has some drawing mistakes ) and whats the name/model of the Amplifier, i heard it's crescendo. I have a couple of 2n3055 made in 88" ( i think they are better then the new ones ) also , its the 2n3772 " better " or at least can be used instead of the 2n3055 in this circuit ?, Thank you, sir ! Hi Bruno, The circuits are perfect! and will work no matter which one you build. Sorry for the delay. PCB softcopy diagrams posted dude. Enjoy. good evening beautiful project . it would be possible to have the technical data of the amplifier ? is it possible to have the PCB soft at chri3399beltrami@gmail.com? Is this a 2.1 amplifier? Or just mono? I am an audio buff. Can you please send me the soft copy of its pcb to geotek_co@yahoo.com ? Please help. Please Swagatam Sir, Kindly upload corrected diagram for error free and last long daily use of this project. Hi Abinash, who said the diagrams were not correct?…both the diagrams are perfect, however the last one has been tested by me…so you can try that. Thank you Swagatam Sir, for your quick reply. Please give your email id for share some valuable information with picture about this project. I will expect support like that from you in future also. If possible, can you please upload a video in youtube of 2N3055 amplifier you have already made in the year 2000. So we can able to hear sound quality of this Class A amplifier. Hi thanks for the info,actually my aim is to build a HI-FI 5.1 home theater system (100 watts in each channel if possible) with tweeter + mid range speakers in 4 of the channels and the rest would be center and sub.So pls advise me what circuit would be the best for this….thanks in advance. Can I build this without any printed circuit board? Or is printed circuitry required? It is suggested to stick to diagram layout yet two pairs of transistors are suggested to be glued together. They are in widely different parts of the diagram. How to do this? 'Fold' the circuitry up? Or have long leads to the transistors, putting them above the rest of the circuitry. This will be a first project ever for me. yes you can do it, because I myself built it on a dot matrix PCB and succeeded in the first attempt…refer to the diagram that's given in the bottom of the article, I think the transistor glueing info may not be correct so don't do it, I'll check and update the correct data soon. okey sir. thanks a lot. ill notify you for an update. sorry sir but im new to potentiometers. should I use the center terminal and one outer terminal? the center lead is the important one, the other one could be any one of the outer two leads. and lastly sir, this is the schematic diagram which my classmates used. is this the same? we are also using 100ohm preset trimmer with the middle pin connected to one of the front pins. Good day sir. We already made the amp but without the inductor first because we didnt have the chance to buy today. We have a little problem. the sound was too low. like there was no amplification. but we used a mono jack to connect to our cellphones. maybe it was the problem. or is it something else? we are so close to finishing this project. is there something we can do? we will try to use a 3 pin stereo jack tomorow and short the left and right. will it be okay? thank you sir. do not connect any music at the input just touch it with your finger, it must produce a very loud buzz in the speaker, and a small hisss when the finger touch is removed…..if this is not happening surely there's something terribly wrong with your circuit assembly. mono or stereo input is not the problem…the problem is surely in the amplifier circuit itself…. 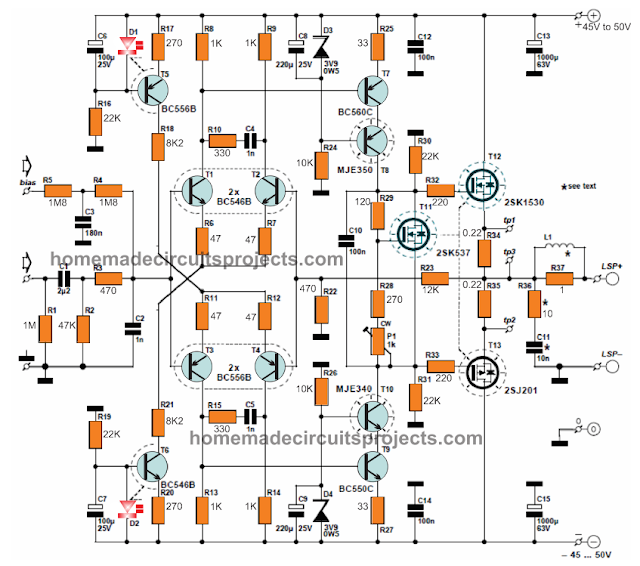 by the way make sure to set the quiescent current with the help of the given preset in the amp….otherwise the circuit will waste a lot of power unnecessarily. yes sir. i can hear a buzzing sound but not that loud. and i can also hear a little hiss when i turn the amp on. but the sound is not that loud. and can the V+ and ground terminals of the P1 interchangeable? check and set quiescent current as explained in the article. Okay sir. Thanks a lot. I'll notify you as soon as the amp is done. i think the line is an excess sir. thank you very for your help. the extension from R12 ground towards left is a drawing mistake, rest everything is correct in the first diagram. Good day sir. I already decided to make the original version and currently building it. My only concern is that my transformer is only around 21-0-21 and after the rectification it goes up to 28-0-28. It would be good to the new amp design but in the original it indicates around 30 to 35v input. Im a little under voltage. Will this be a problem? Good day evo, there won't be any technical problem if the voltage is decreased, the wattage of the amp will decrease proportionately…. that's all . I would also like to inform you that my classmates had a problem with the new version of the design. the LED on the upper part wont turn on, T13 explodes and C7 is connected on the wrong terminal. The first time they turned it on, C7 exploded. I think its because the positive terminal of the capacitor is connected to the negative of the power supply. That's why I decided to make the original version. I'll also update as soon as I finish this project. Thank you very much sir Swagatam. One last thing sir, in the original design, there are C3, C4 and C5 connected in parallel with 820nF each. We have a difficulty in resources here so I cant find an 820nF. But when the three are added, they will have a sum of 2.46uF. The nearest capacitance I can buy is 3.3uF. And I have no choice but to change the three capacitors with one 3.3uF. Im just not sure if this is still okay. I apologize sir but I'm new to this. You've been a great help. Evo, the new version is also correct except C7 which needs to be reversed and R12 ground side short, except these two drawing mistakes all seems right in the diagram. connecting 3 in parallel will have other benefits but you can also try a 3.3uF instead it would do any harm. Good day sir. I used 4 capacitors for the parallel connection with 560nF. their result will be closer to the sum of 3 capacitors of 820nF. I havent tried it yet coz I have a difficulty having the result of 4-6uH for the inductor and my potentiometer broke. thank you for your help sir. for the inductor simply wind any moderately thick magnet wire over the resistor itself….wind 20 turns. do you mean i'll put the inductor on top of the resistor? or wrap the resistor? sorry sir coz im a little confused. then connect their legs in parallel. thank you sir. I still have to wait until monday to resume making the amp. thank you very much sir for your non stop help. yes that's right, wind the copper wire directly over the resistor and then solder the leads (resistor and the coil) together across the given PCB holes. this part sir, at the picture. the horizontal line. good day sir. I am currently making this circuit. I just have a question. At the bottom left, is there really a connection under R12? I just notice that there was an excessive line going to the left and it is not like the one on the top left. I am just confused because if they are really connected, then the non-connected lines between R14 and R19 are useless. Can you please clarify sir? I will wait for your response to be able to continue the build. Thank you. good day Evo, i can't see any extra line anywhere, R12 and R11 rails seem exactly symmetrical…did you click the image to enlarge?? please click it to enlarge. Good day sir. Could you please send me a copy of the PCB layout. Thank you very much. And I also noticed the power supply circuit. Is the output going to be 25V/5A? Coz I can see a 30V on the bottom left. thank you sir. please send me the above pcb diagrams. Is it possible to convert a existing 2n3055 based amplifier into a mosfet one. can we use MIC 6A4 diode in power supply. Hi from Athens, could you please send me the PCB layout for this amplifier. sorry, PCB layout is not available……. there's something not correct in your circuit, check all the connections many times you should be able to locate the fault…I built this circuit some 10 years ago and succeeded at the first attempt. I have built the amplifier, and i am getting an amplified signal out of the speaker, but it is very quiet, and a bit distorted. I tested the voltage over all the tranistors, and its at approximately 35 volts, except the T7+T8 – they are only showing between 0,1 – 1V. What could I be doing wrong? No, there's definitely something hugely wrong with your connections or the parts. Once built and set the output should provide a large amplification, even without any input music you should be able to hear a big Hiss on the speaker. did you adjust the quiescent current as suggested in the article?? is it possible for you to send me a pcb layout for this amplifier? Hi guys, could you please send me the PCB layout for this "Crescendo" amplifier. My email is ttararo@gmail.com. This looks like a very nice amplifier, thanks for the detailed schematic and items list! I have just ordered the components and I'm excited to get started! I have one questin though – I can't seem to figure out the recommended power suppy voltage/current. I'm confused with the shchematic sayin "Tr1, 2 x 25" Do I need a dual transformer, or? If I only need one, will 30 Volts at 5 Ampere be suficient? Can less do it? The transformer needs to be a center tap transformer, that is with two sets of winding on the secondary, rated as 24-0-24V at 2amps or more. you can use a transformer rated at 30-0-30V/2amps also. Thank you very much. If I want to make 2 of these amplifiers, one for each channel, can i just make two identical amps and ground them to the same "0" on the transformer (offcourse with twice the current), or do I need 2 seperate center-tapped windings with their own respective "ground/0"
(+) ans (-) supply lines will also need to be joined as common rails for both the units…. presently i do not have it, i'll try to post in soon and let you know. ow do you have above amplifire pcb diagrame? …and please do not include external links, i'll just keep deleting them. I'll try to include it soon in this blog and give you the link…. is there a good quality bass in this amplifire. checkout this links and tell me the witch transistor is good for this circuit. please some one send me the PCB soft copy. upload that and give me the download link. as mentioned in my previous comment, both the transistors are good and rated almost equally, it depends which one you prefer as per your convenience. The value of L1 has been updated in the parts list. there are 2 types of 3055 transistor. first one is 2N3055 and other one is TIP3055. TIP3055 is a big transistor. 2N3055 is like a normal transistor. which one is good for this amplifier. I cant understand the L1 . How can i make it in home. I'm stuck in this plese reply me soon. Both the transistor types are almost identical with their specifications, only the package is different. You can use any of these as per your convenience….I have updated L1 data in the parts list. Would it be okay if i use all the smd component instead of through hole component ,can my circuit behave diffrently under smd components ???? yes you can use SMD, the circuit will work perfectly with them too, no issues. That's great support Lancy, Thanks very much. Don't use passive filters, use active filters as it will enhance the effects rather than deteriorating. it's a big explanation, cannot provide it here….these grounds are intended for providing discrete paths for analogue and digital signals, they should not be joined. By carefully adjusting the 22k presets. replace the feedback 1K resistor with 100k pot and remove the series 1N4148 diode. I am sorry kanagaraj, I do not have any such circuit presently in my blog, I will try to update it if possible soon. I want to made this audio amplifier circuit. But in the amplifier circuit you show the 25V supply and in power supply circuit there is 30V. What is co-relation between them. secondly, I want to known the rating of center tap transformer you have used.